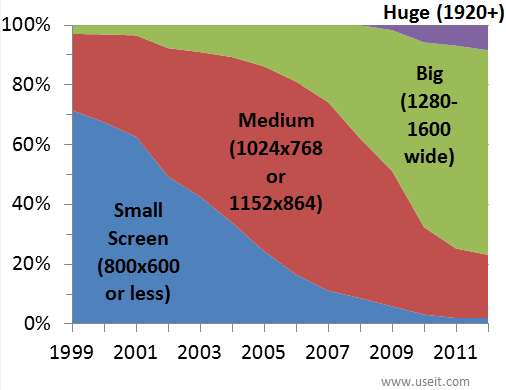 Wide are our screens, limited is our vision. Much as I’d like to wax philosophic on such a fun title, let’s instead discuss the practical use of the screen real estate of our computer monitors. Please look at the nearest calendar. Is it 2014 where you are or pre-2009? Look at your computer screen, not your mobile device screen, we’re talking about computer screens right now. If you are using nothing but 4:3 screens then this discussion still applies to you, but less than to those using 16:9 screens. Are you reading this with your browser window filling the entire screen? Is this your standard viewing behavior? I believe you are seriously impeding your productivity by limiting your vision. Guess why we call them windows regardless whether you are using actual MS Windows or Mac? Do you scroll side to side or down web pages? That’s right, you scroll down / up vertically. Given the 4:3 vs. 16:9 comparison above, what is your least viewable dimension? That’s right, the vertical one. This means you have lots of horizontal room for viewing and using other windows simultaneously. My recent perusal of folks working at their computer monitors shows an unexpectedly high number of them using applications full screen all the time. This has become a problem as, over the phone, I try to walk customers through simple functions such as dragging a file from a folder to attach to an email or copy-n-paste between apps. Basic 1990s stuff, I’d have thought! It’s a simple and quick, hence productive, function made unnecessarily difficult if everything is full screen. Yes, I even see folders being displayed full screen! Full screen all the time is one of the reasons for my previous Win8 rant! Watch this short video for a window view into increased productivity.